CBH general manager operations David Capper, Intermodal Group chairman Jim Stevenson and Intermodal Group’s Darrin Smith and Adam Lebihan celebrated Intermodal’s half millionth container movement. Proof of Western Australia’s intermodal progress has been underscored by Intermodal Group’s hailing of 500,000 containers shifted since its 2007 inception. The port rail freight operator estimates its services are taking the place of about 2,000 truck movements weekly or 104,000 every year. The firm operates two train cycles a day between the North Quay Rail Terminal (NQRT) in Fremantle and Forrestfield Intermodal Terminal. Intermodal Group chairman Jim Stevenson notes that, aside from the obvious commercial benefits to industry, by moving bulk volumes in and out of the port area, the environmental and social benefits have contributed to rail’s increased popularity in recent years. "Every container that travels by rail reduces the impact on our road system," Stevenson says. "More trucks off the road means reduced road congestion, leading to improved road safety, reduced greenhouse gas emissions and minimised road infrastructure wear and tear. "Our target is to transport 30 per cent of the port’s containerised volume by rail, to be the most successful port rail shuttle operation in Australia, and to continue to make a positive contribution to the Fremantle and Forrestfield communities and environment." 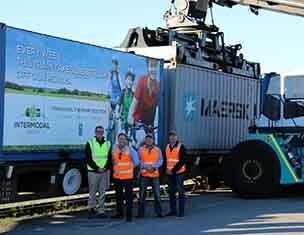 Intermodal Link Services was originally established in response to the needs of major agricultural exporter CBH.